The first dual analog shooter on a handheld device... Should be great, right? Well, it's not great, but it did show a lot of promise for the genre on Sony's portable system. Here's our review of Resistance: Burning Skies. Resistance is Futile. And Passable. One of Sony's more recent franchises that certainly hasn't been giving its worthy due is Resistance. Instead, Sony has been more focused on Killzone, another first-person shooter franchise, albeit one that predates Resistance. That said, we've always cared more about the PlayStation 3 debuting shooter series rather than Killzone. Perhaps the setting of Resistance, the story, the characters, the action, the weaponry, and no Rico have something to do with that. Regardless, Resistance finds its way to the PlayStation Vita, serving as the first ever handheld first-person shooter with dual analog controls. 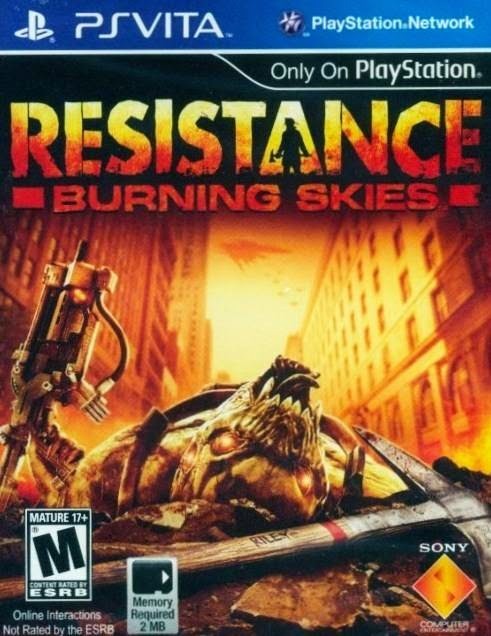 While Resistance: Burning Skies does make it clear that Sony's PlayStation Vita is perfect for first-person shooters, it doesn't make it a great game in the end. Short animated comic book cutscenes chronicle the plight that the U.S. and humanity in general is currently facing with the Chimeran horde. You take the role of Tom Riley, a firefighter who simply wants to be reunited with his loving wife and darling daughter. Of course, this journey meets various speed bumps, mostly because Riley wishes to save every person he ever encounters. Then again, you have to make things interesting in a story, right? Unfortunately, Burning Skies' story does little to entertain regardless. It's mostly dull, uninteresting, and the characters do little to make you care about them. FPS screens, since all you're doing is shooting stuff. What is also rather dull is the gameplay. Now, while Resistance: Burning Skies definitely proves that the PlayStation Vita with its dual analog sticks are great for first-person shooters, the game is by no means a textbook example of how a portable shooter should be. This is mostly to do with most enemy encounters and level design. In the console Resistance games, the Chimera are very aggressive in taking you down. This is not the case in Burning Skies. Enemies are much smaller in number, they seldom come after you, and really, all one needs to do to vanquish them is to lay low behind cover and occasionally pop up to fire. You can alternately simply run up to them and use your one-hit KO move, an axe strike, to put the Chimera in their place. The fact that you are invincible in the KO animation makes battles much easier to regain your health in. The problems go into level design as well. Far too many times you're battling in the confines of corridors and hallways. When the action happens in more open areas, Burning Skies' action shines more brightly. Enemies, though as seldom as they do so, can run over to where you're hiding and shoot at you. The first 3/4 of the game relies heavily on corridor design. The latter quarter of Burning Skies has much more interesting rooms, offering unique offensive and defensive options for players to utilize. The variety of foes that you face at one time also gets a boost, making confrontations less of a grind and more of an exciting proposition. Okay. I'll try to come up with a caption here. Uh... "These bullets in your face will make it look better!" ...I don't know if that one went well or not. Of course, you can't just take down the whole Chimeran army with just Tom's axe. There are eight weapons to acquire throughout the duration of Burning Skies' campaign. 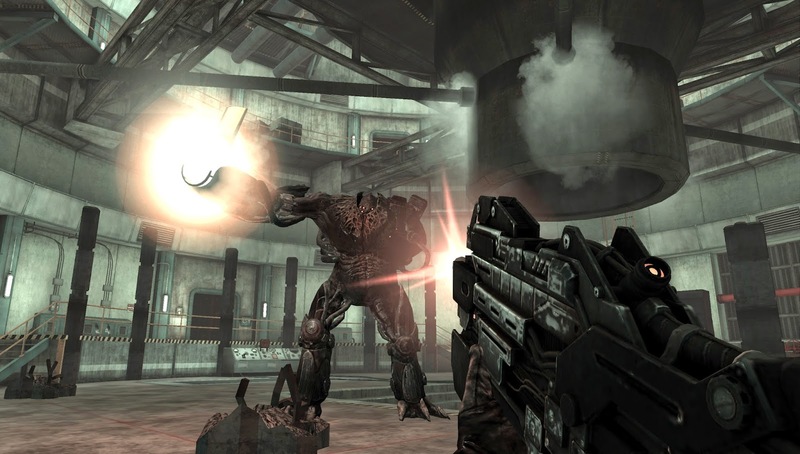 There's the traditional Resistance fare, such as the Auger, which fires bullets through walls; and the Bullseye, an automatic rifle that can tag enemies and thus home shots in on them. 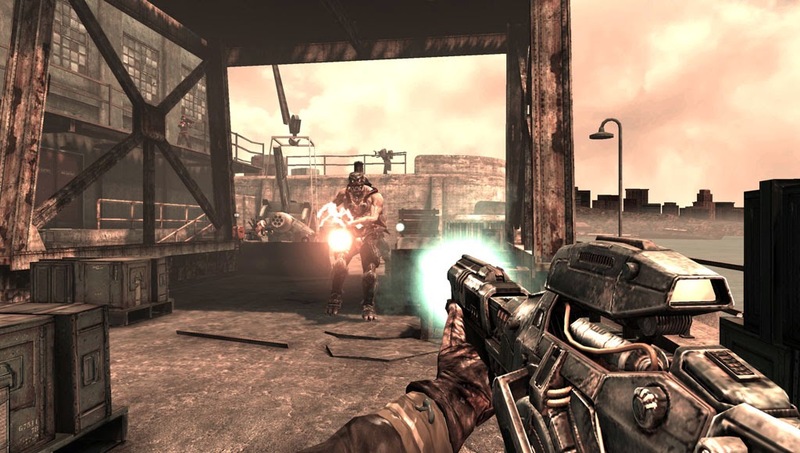 While most of the guns aren't really as inventive as past Resistance games, where the real fun comes in is with the secondary fire functions of each weapon. One weapon's secondary fire has a drone launching from it, shooting at all enemies until it hits a wall. Others allow you to target multiple enemies at once with a rocket launcher, or a crossbow that grants you an explosive shot. The more complicated battles require you to shuffle between multiple weapons to survive. This is all the while moving from cover to cover, dodging a barrage of bullets in the process. "Nice arm. Lose a bet?" These secondary functions all require the player to interact with the touch screen. 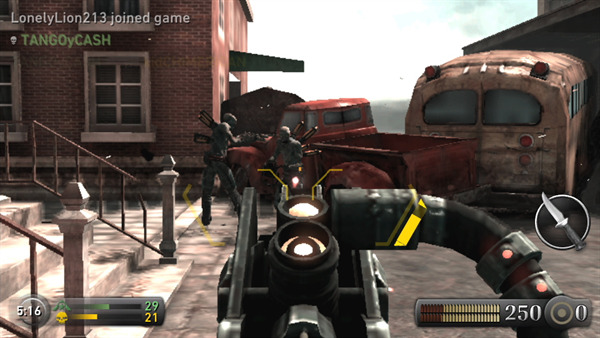 For example, the aforementioned rocket launcher can blast out a deluge of rockets at a number of enemies simultaneously by dragging your finger over each desired target. The crossbow gets armed with an explosive round by sliding your finger in a downward diagonal direction. This is also how grenades are thrown, and while these mandatory touch screen moments may seem gimmicky and difficult to ascertain, once you've gotten them down, they feel completely natural, and dare I say even fun. Through acquiring hidden blue cubes strewn across the campaign levels, you can customize the various guns of the game. You can only have two cubes equipped to a single gun. Therefore, of the six different upgrades available, you can only have two equipped on a gun at the same time. Whether it's faster reload speeds, greater explosions, or less recoil (just to name a few), you can tailor your arsenal to fit your play style. The campaign itself spans seven missions with multiple chapters to them. The game can be completed in about five hours, but there's collectibles in the form of files to obtain. Though these simply add more background into an already boring story. Multiple difficulty levels are also available to attempt. However, these just make Tom Riley less of a bullet sponge and do nothing in the way of making enemies smarter or the level design more interesting. Heck, there's not even much enticement in playing on any mode than easy due to the fact that there are no difficulty-related trophies, if you're into that sort of thing. There is, however, multiplayer to keep players coming back if they so wish. 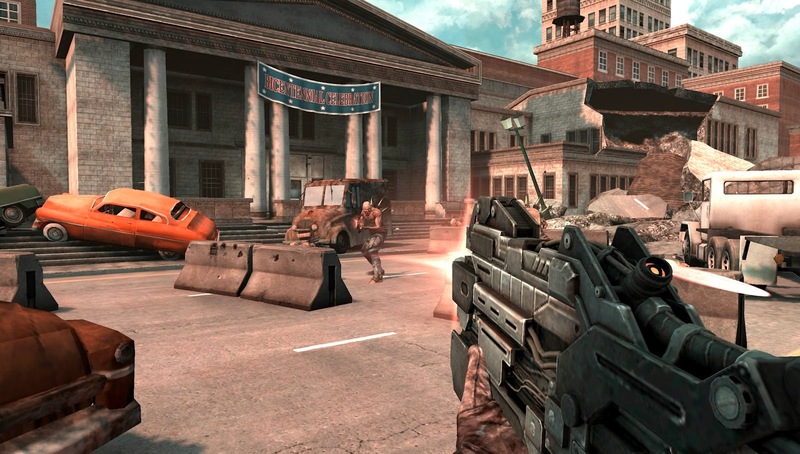 This offers up to eight players the chance to participate in three modes for online play: standard deathmatch, team deathmatch, and a survival mode where every killed player turns into a Chimera, and the round ends when all humans are eliminated. As you play and win more matches, you earn experience that grants you new weapons from the campaign to use in battle. but there's now better offerings available on the Vita. Maps are generally small, but they are interesting in their design, something that surprised me considering the campaign's less than impressive approach to its levels. There's always a feeling of pressure in the multiplayer, as your character can die within a few shots, but at the same time, other players can be killed just as quickly, too. This ends up with less experienced players seeing their character down on the ground dead more than seeing them standing upright. When it concerns Resistance: Burning Skies' visuals, there is nothing here that pushes the Vita hardware at all. Downed enemies have their corpses disappear soon after hitting the ground, levels are full of drab colors, and character models aren't very exciting to look at. As for sound, the majority of what plays during the campaign and multiplayer is purely ambient, environmental noises with little in the way of music. This simply adds to the dullness of the entire game, unfortunately. 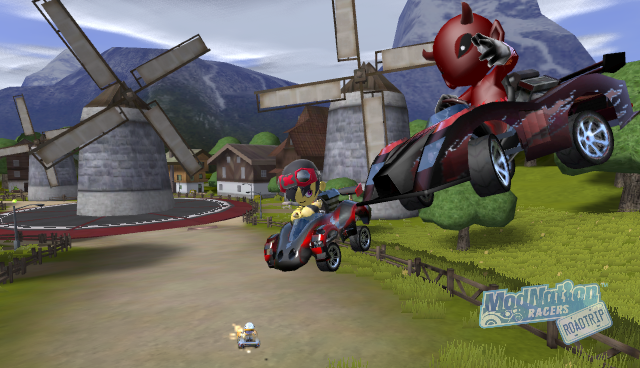 Our month of the PlayStation Vita continues with this review of the latest in the ModNation Racers series. This second portable title boasts more features, a better presentation, and lots of options for players. Here's our review. The PlayStation Vita's launch lineup consists of some exceptional titles, all building up and adding together to create one seriously powerful library of games right from the get-go. While some are better than others, there's no doubting the quality of what the Vita came out with right out of the gate. Various franchises that hit the PlayStation 3 have seen Vita versions, such as Uncharted, Hot Shots Golf, WipEout, among others. Another such series is that of ModNation Racers. 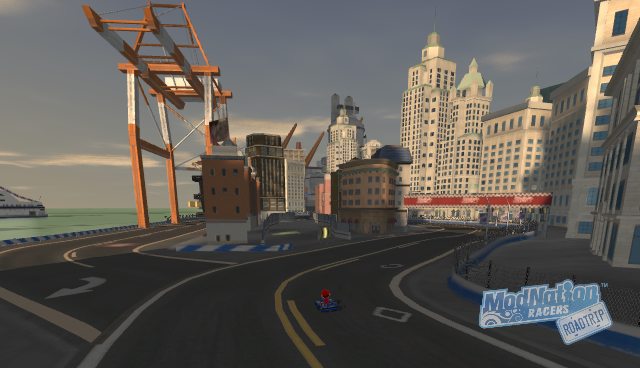 With powerful hardware behind it, increased customization options, and the unique features of the Vita to work with, ModNation Racers: Road Trip should be an exceptional kart racer. Unfortunately, Road Trip hits a few speed bumps along the way, not quite crossing the finish line in first place. 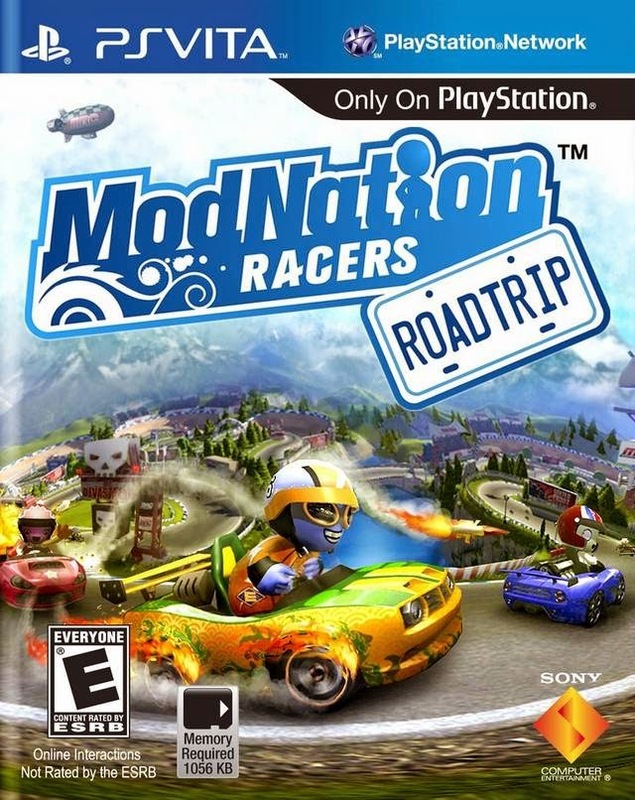 ModNation Racers: Road Trip forgoes the story of starting off as a nobody racer and slowly becoming champion that the PlayStation 3 and PlayStation Portables games contained. Instead, there is no story to speak off. Biff and whatever that other guy's name was don't even do commentary anymore. They aren't even in the game for the most part, outside of billboards. Don't mind me, I'm just a Sunday driver. Anyway, what is present now is Tour Mode. This encapsulates five different tours of five races each. (There's a sixth unlockable tour that is unlocked when certain conditions are met.) The objective is to come out with the greatest amount of points after all five races are complete. However, this isn't set up like Mario Kart, where it's one race after another. No, you simply choose a race and you can retry it as many times as you like. You can even choose to come back to that race and try it later. 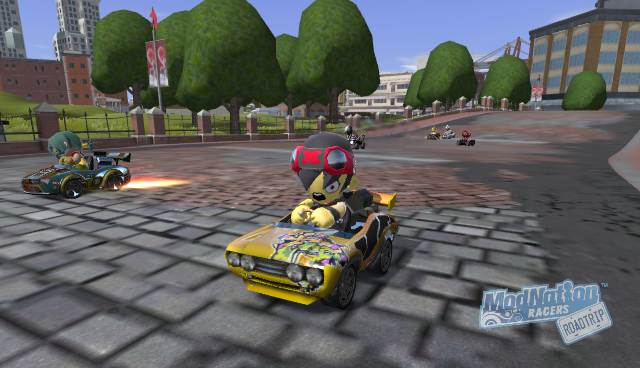 Like past ModNation Racers games, each race has three challenges to complete in order to unlock Mod parts, kart parts, and track pieces for the creation sections of the game. These challenges include things like not hitting a wall for one lap, hitting five opponents with items, racking up a special amount of drift points, and other things that will make you not just race for the checkered flag, but to do so with some style. Take three shortcuts in a race? Racing is what you'd expect out of an arcade style kart racer with some alterations to make things feel fresh. For one, the racing controls feel tight and responsive. You don't really feel like you're out of control unless you're taking a boost at a strange angle. When you drift around corners and turns, not only are you slightly faster and able to take these corners in a better way, but you fill up a special meter. This meter stores energy that allows you to either boost or shield yourself against oncoming attacks. Yes, even those that go after first place can be avoided if you have enough meter juice to shield yourself with. also helps to fill your meter. Of course, you can unleash attacks on your fellow ModNation racers yourself with weapon pods strewn about each of the game's thirty tracks. There are different categories of items, each represented by a different color. Speeding across one weapon pod will give you a level one attack. Collecting a second weapon pod (which will always be the same color as the first pod you drove across) will beef that up to a level two attack. A third weapon pod will obviously strengthen your item to a level three. For example, collecting a red weapon pod will give you a missile shot that shoots straight out and explodes when it hits another opponent or a wall. Collecting a second red weapon pod (pending you haven't used your level one attack) allows you to use a lock-on missile that serves as a homing attack to one racer. Finally, a level three attack fires a barrage of homing missiles on every racer in front of you. Weapons from pods can also be exchanged for meter energy instead of being used on other racers. 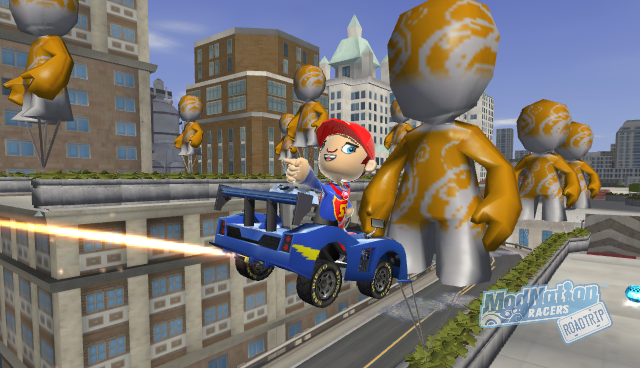 The biggest asset to ModNation Racers: Road Trip is its abundance of features that allow you to create creative Mods (the racers that drive vehicles), karts, and tracks that can be shared and downloaded online by different players. The thing here is that in order to get the really good customization options, you need to complete the numerous challenges in Tour mode. Mod and kart creation is simple enough, offering a myriad of customization options, parts, and color options to make sure that no two creations are ever alike. You can really create some truly incredible stuff. 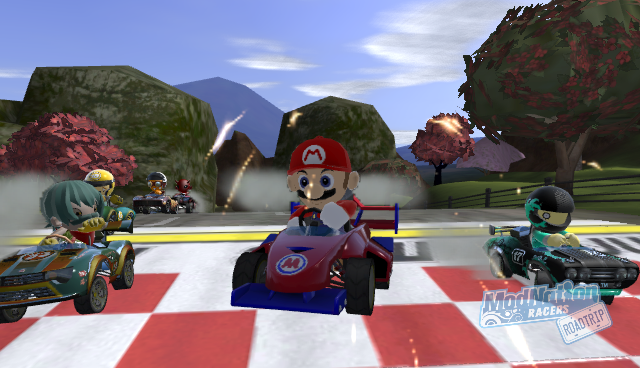 The community has made various Mods, karts, and tracks based off of other video game franchises, comic books, film and TV, and much more. Did we go to high school together? 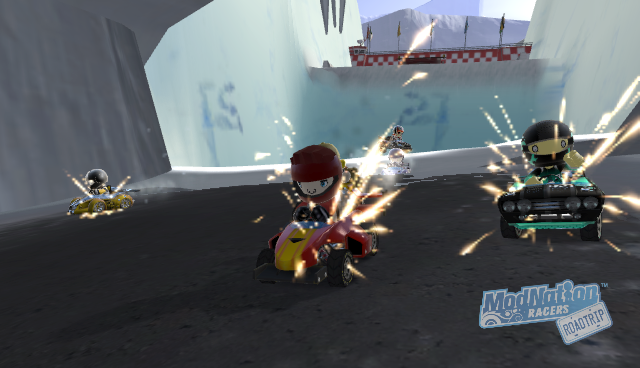 Creating tracks in this installment of ModNation Racers has never been easier thanks in part to the various technology featured in the PlayStation Vita. For instance, placing down props like trees and buildings is as easy as sliding your finger across a section of the landscape. Hills and props can be enlarged and shrunk down via putting two fingers on top of the feature and either spreading them apart or pinching your fingers together. Track creation itself is a breeze. You can either create the track by driving around, making a path behind your driving path, or you can simply use your finger on an overhead view of the available land mass to draw a track. I prefer the latter option. If you're feeling lazy, you can even have the game auto-populate your track with props. I use this method myself, but I think tinker with the track's surroundings and props to suit the type of track I want to make. The biggest downside to this edition of ModNation Racers is that there is nothing in the way of simultaneous online play. 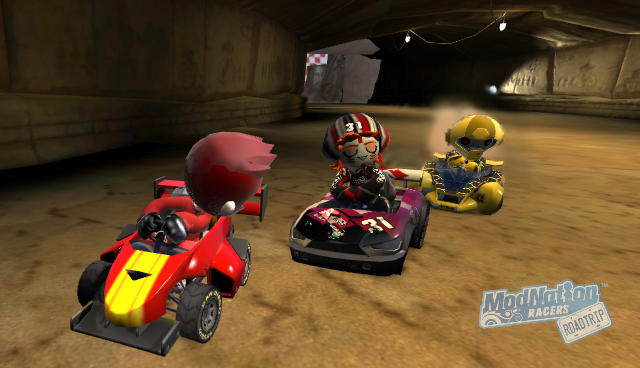 What made the PS3 original and even LittleBigPlanet Karting so fun was that you could create your own designs, whether they be Mods, karts, or tracks, and race with or on them with other players. It was an absolutely awesome experience. While owners of Road Trip can download, rate, review, and play with or on your creations, you just can't play online with others. Instead, the developers have included asynchronous gameplay, even going so far to say it's an experience just like an arcade but without losing all those quarters. This pretty equals glorified leaderboards on tracks, and that is pretty much it. It's rather disappointing. of May for your own kart racer, could you? ModNation Racers: Road Trip also suffers from severe pop in, poor draw distance, and extreme cases of slowdown, where the frame-rate noticeably chugs during races. These performance issues certainly didn't ruin my enjoyment of the game, but they will bother other players much more than they did with me. However, one part of the game that did bother me was the sometimes unresponsive menus. I recall having to tap on icons more than once to get them to register. Highly annoying, as you can't use the d-pad or the buttons in most menus for a much nicer user experience. Still, what ModNation Racers: Road Trip lacks in polish, it makes up for with all of its customization options and solid gameplay. It's genuinely fun to race on your own designed tracks as well as the game's already built Tour mode tracks, and speed through turns and shortcuts with your created Mods and karts. 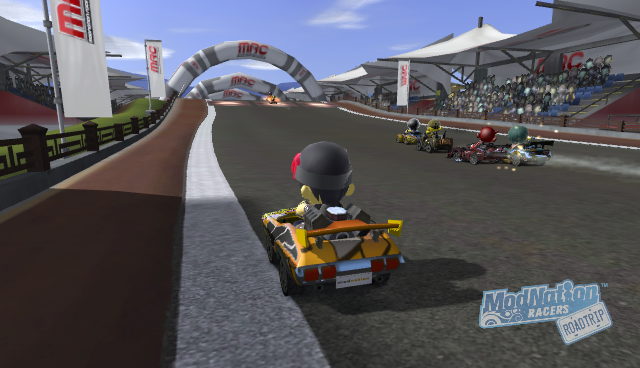 The omission of true online play is indeed a glaring one, but I still believe ModNation Racers: Road Trip is definitely a worthwhile kart racing game that does the ModNation Racers series and the kart racing genre as a whole due service. Rev up your engines and take to the pavement, as this Road Trip is worth taking. Welcome to SuperPhillip Central's first PlayStation Vita review! Our first game we're going to look at is a Sony sports staple, Hot Shots Golf, or as PAL players know it, Everybody's Golf. Let's see if Hot Shots Golf: World Invitational gets the swing of things with our review. World Invitational: Is the Hot Shots crew swingin' or shankin'? 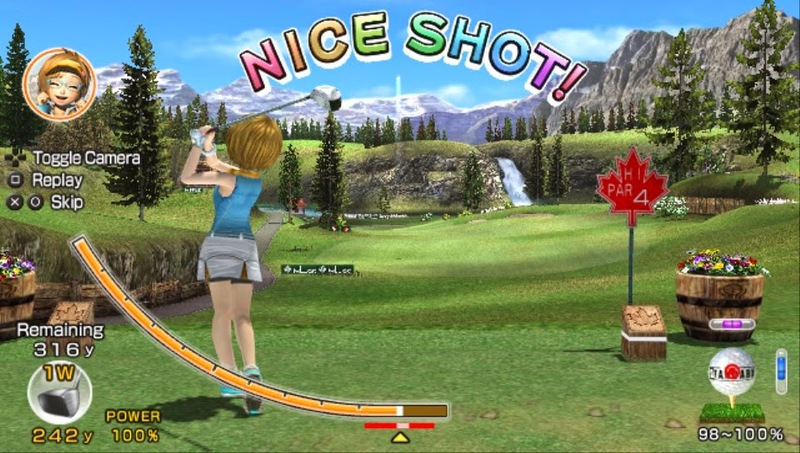 Ever since premiering on the original PlayStation, the Hot Shots Golf series, or as it's known in Europe and Australia as Everybody's Golf, has served players with a brightly and bouncy golf game for players of all ages to approach. 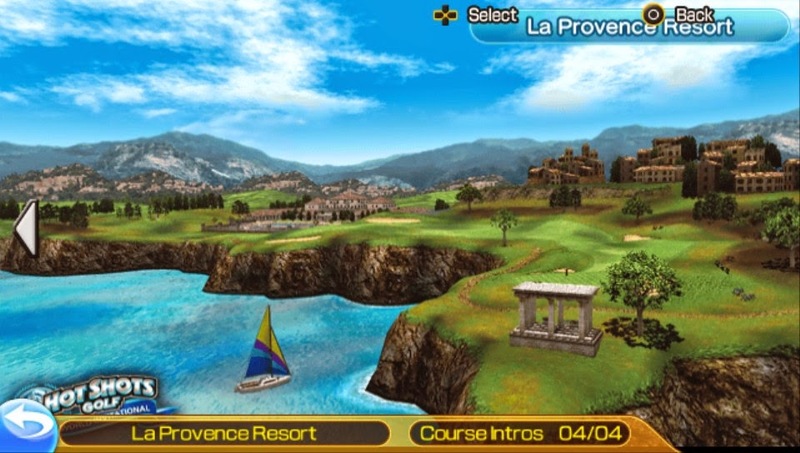 However, under that cute and charming facade lies a quasi-realistic golfing experience for players. This is both a blessing and a curse at the same time, as Hot Shots Golf: World Invitational, the latest game in the long-running series, shows. 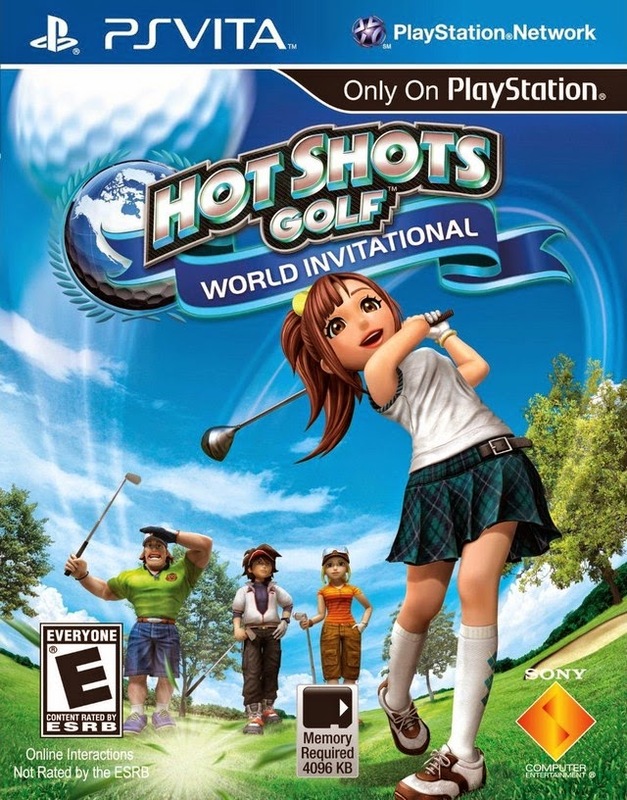 Does Hot Shots Golf: World Invitational score a birdie, a bogey, or just sticks with a safe par? The meat that makes up the solo experience of Hot Shots Golf: World Invitational, outside of stroke play and practice, is the Challenge mode. If you've played a more recent Hot Shots Golf game, you will feel right at home to this mode, although it has a change or two. There are various tiers of tournaments to tackle. These are spread across the game's six courses, have players participating in 9 or 18 hole events, and sometimes have specialized rules like adding a stroke to your score if you land in a bunker or take too long to set up your shot. The goal here of all events, regardless of any special rules, is getting first place and earning a star. Only by earning the necessary amount of stars allows you to take on that tier's versus character in Match Play. When that character is defeated, you are allowed to move on to the next tier of challenges, and are able to unlock the shamed character you so aptly conquered on the links. what you want for your tee off. By satisfying specific conditions in the various challenges, you can earn a crown instead of a star. 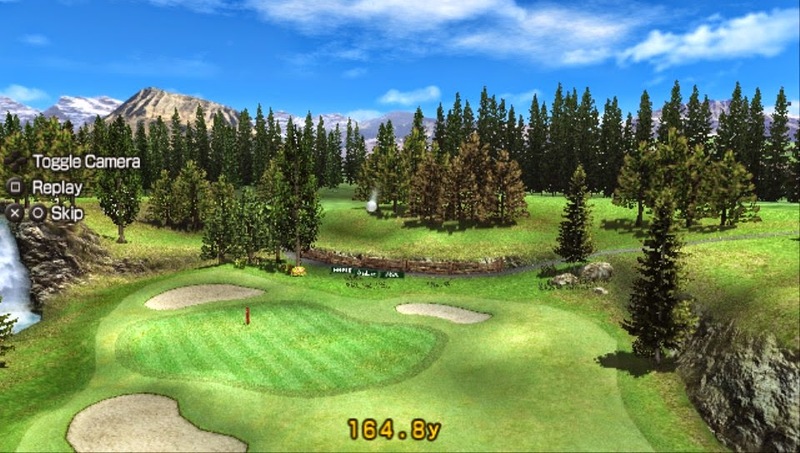 These conditions include things like having 100% fairway accuracy, never hitting the ball out of bounds, making a certain number of birdies, etc. This adds to the replay value of Challenge mode. 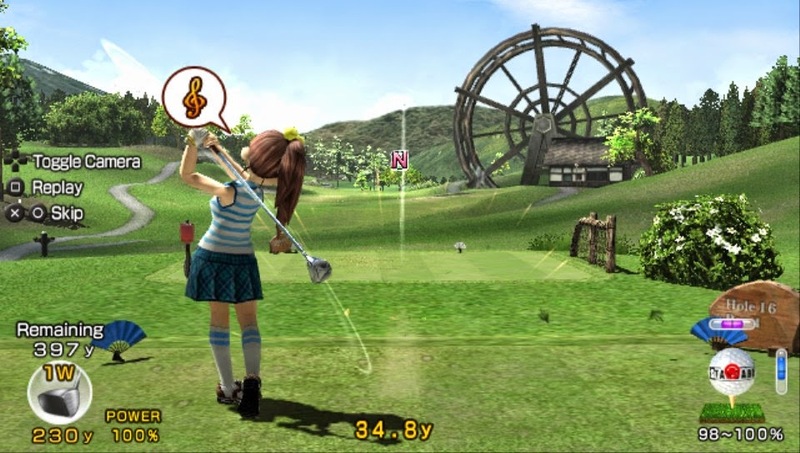 I must say though that this setup for Challenge mode that has been used in Hot Shots Golf: Out of Bounds (PS3) and the PSP spin-offs (Open Tee 1 and 2 is starting to get long in the tooth. I'd love to see a total renovation of the formula. 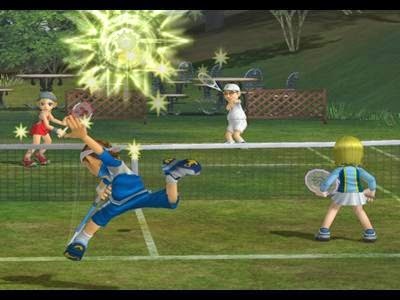 Perhaps Clap Hanz could take some inspiration from another one of their titles, the PSP's Hot Shots Tennis: Get a Grip, and create a story-like mode where players could earn new costume pieces and gear from beating opponents in the story. That's just one idea anyway. Take on the AI in Match Play. Another issue comes in the form of the later courses. There's a rather large spike in difficulty going from the Bronze rank to the Silver rank of tournaments. The last course itself has incredibly narrow and short fairways, lots of opportunities to hit the ball out of bounds, and it seems like the course's hills are set up to screw you over. It's a very difficult course, and quite frustrating too. My big bother with this is that you're not really set up by the game to be prepared for this final course. It's just a huge difference in difficulty from the fifth course to the last course. sense of security, and then BAM! You're cursing the golf gods! There's an in-game currency system that awards you with points for finishing rounds, scoring under par, taking a top place in tournaments, and satisfying certain conditions. The points earned from these rounds go towards purchasing new characters, courses for free play (outside of the main solo mode), gear, different swing styles, concept art, costumes, and much more. It's a bit of a grind to get the more desirable rewards, but it's something that will keep players hanging out on the links to acquire everything Hot Shots Golf: World Invitational has to offer. World Invitational has several unique swing systems that players can utilize, although only two are available from the start. The first is your standard three tap system that uses a gauge to determine power and accuracy. The other is a combination of the gauge to set power and a circle that encloses on a mock version of a golf ball to set accuracy. a screenshot and hit the ball well. 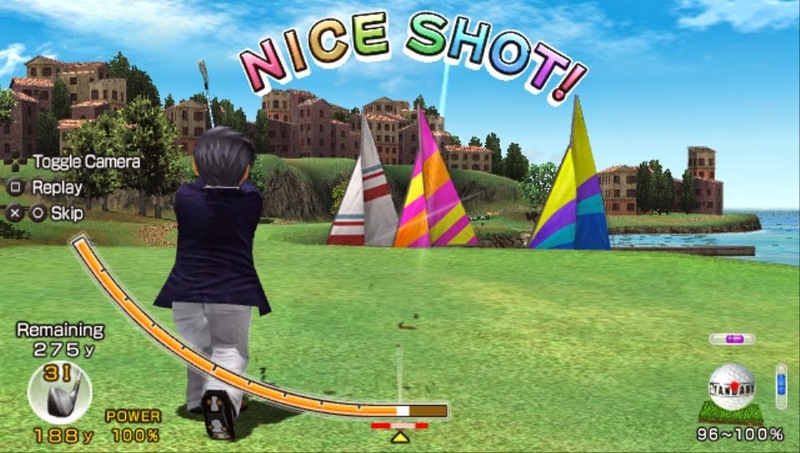 For a game with such a welcoming appearance, Hot Shots Golf: World Invitational can be very tricky and it requires a lot of reading the lie, wind speed and direction, elevation, and much more in order to pull off the best kinds of shots. The largest concern for players is striking the ball with the proper timing, as even being a split second too early or too late can result in unwanted hooking. This is especially dangerous in the harder courses, where one fouled up shot and/or miscalculation can be the difference between making par and getting a triple bogey. go to a car-- I go to the links. Depending on which of the colorful cast of golfers you choose, you'll have a golfer with different stats. World Invitational, like other Hot Shots Golf games, list characters in five stats: Power, Control, Impact, Spin, and Sidespin. Additionally, a lot of the time the various characters have areas they excel in and aren't so hot in. For instance, one golfer might be great in the rain but absolute horrid in bunkers, or one golfer might have a powerful swing, but he's not very good in the rough. There's plenty to think about when choosing a golfer, and the more you play with a given golfer, the better that character's loyalty to you goes up. This affects how many power shots they can offer you, as well as other nifty features. 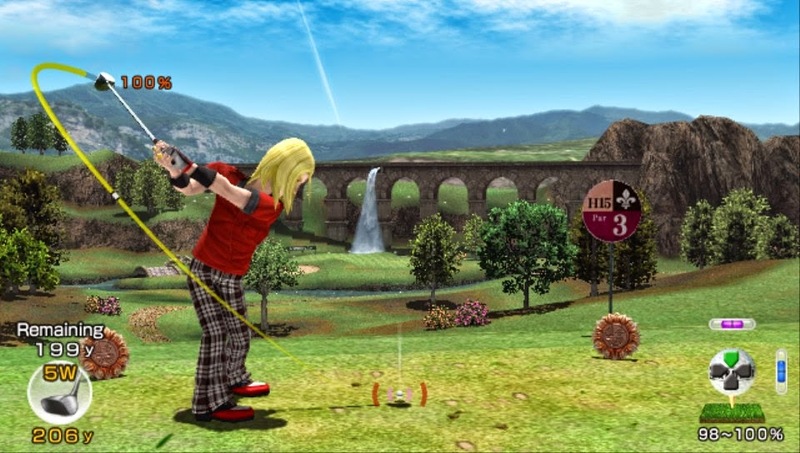 Outside of playing by your lonesome, you can take to the links with friends via Ad Hoc play, and you can hop online to challenge foes from around the world. There's daily tournaments that put you against the pack, attempting to post a respectable score online and hit the top of the ranks. There's an element of pressure on you, as you can only enter a tournament once, so make sure your skills are up to snuff, and your aim is true. His expression tells this tale perfectly. Hot Shots Golf: World Invitational is a beaut of a game, and this launch title shows the promise of the Vita's graphical power. Courses are tremendously detailed, whether it's buildings surrounding a given hole or a series of squirrels scampering across the fairway; characters look absolutely wonderful and animate beautifully; and everything adds up to a cohesive, sensational looking game. Load times are minimal, save for when entering a course for the first time. The duration of loading between holes is almost instant. 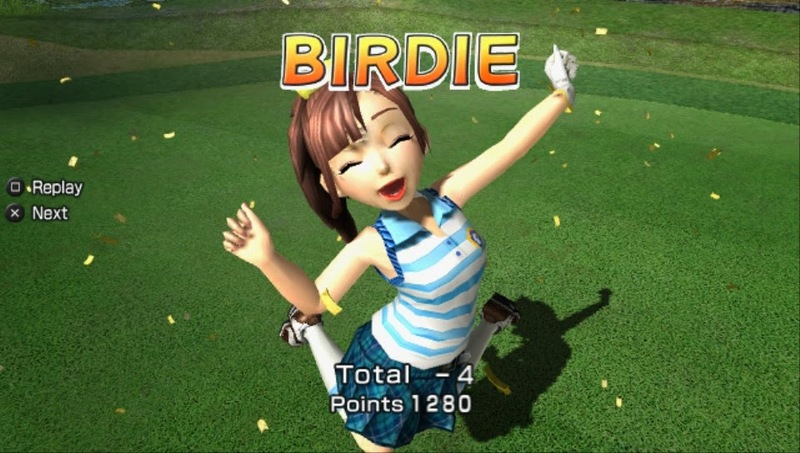 The character voices bring each golfer some added personality, and the music is suitably cheery at times while low key at others. not a navy one, you silly billy. If you're looking for a less simulation-like golfing experience than what you would find with EA's Tiger Woods line of games, Hot Shots Golf: World Invitational is an excellent choice. Just be forewarned that just because it isn't as complicated as what EA offers, World Invitational can still put a player in his or her place, as the game is quite challenging, sometimes frustratingly so. It stinks to be playing a round just fine for thirty minutes and then making one poor shot near the end, completely ruining your score and making those past thirty minutes a total wash. 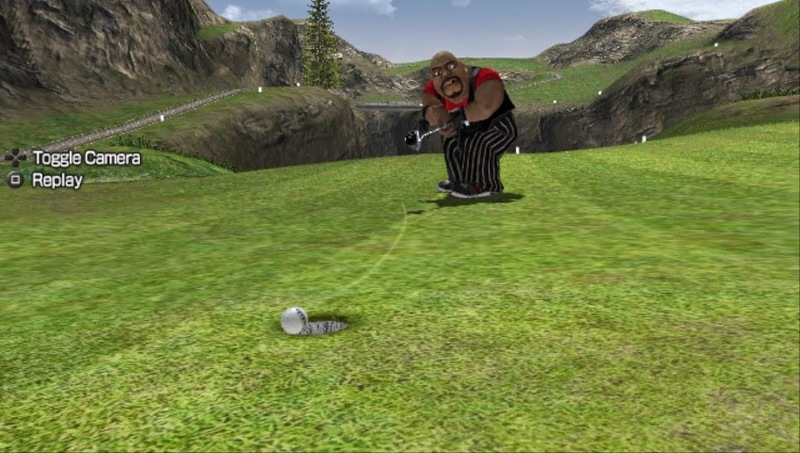 Still, if you can persevere and overcome these aggravations, Hot Shots Golf: World Invitational continues the series' rewarding gameplay and charming personality. Welcome to a new edition of SuperPhillip Central's Favorite VGMs! This week we're all about PlayStation platforms, particularly the more retro ones, such as the PS1 and PS2. 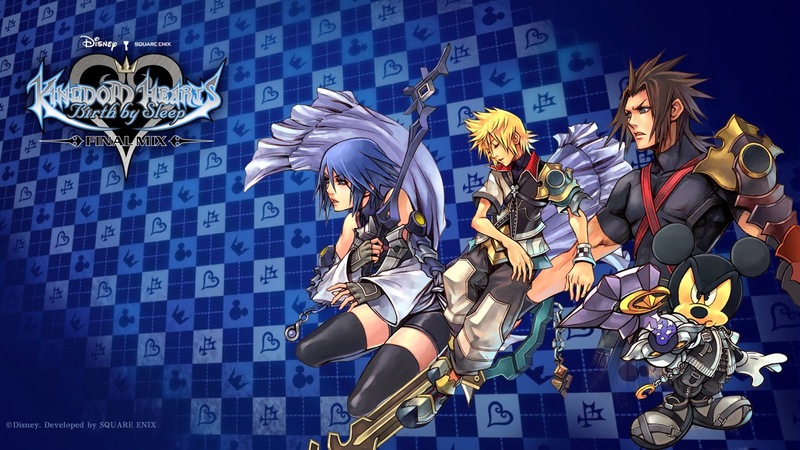 We have music from games like Metal Gear Solid, Jak and Daxter: The Precursor Legacy, and Kingdom Hearts: Birth by Sleep. If you're ready, then let the music carry you away! 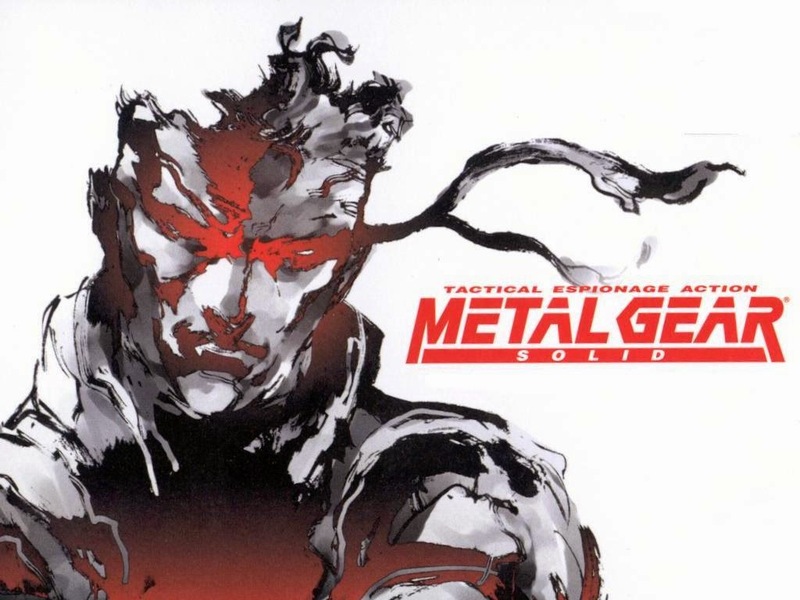 The ending theme of Metal Gear Solid, an exquisite masterpiece from the original PlayStation, The Best is Yet to Come is a haunting vocal theme, perfect for the finale of the game. We're going to get slammed for this, but we are among the few that actually enjoy the GameCube remake, The Twin Snakes, despite the new first-person perspective not really be conducive to the original's design. Still, it's a fun return to the classic that made the Metal Gear series so beloved. The theme that plays in the first level of Klonoa: Door to Phantomile, this song starts with a pan flute introduction, then the strumming of a guitar backs up the piece as accompaniment. 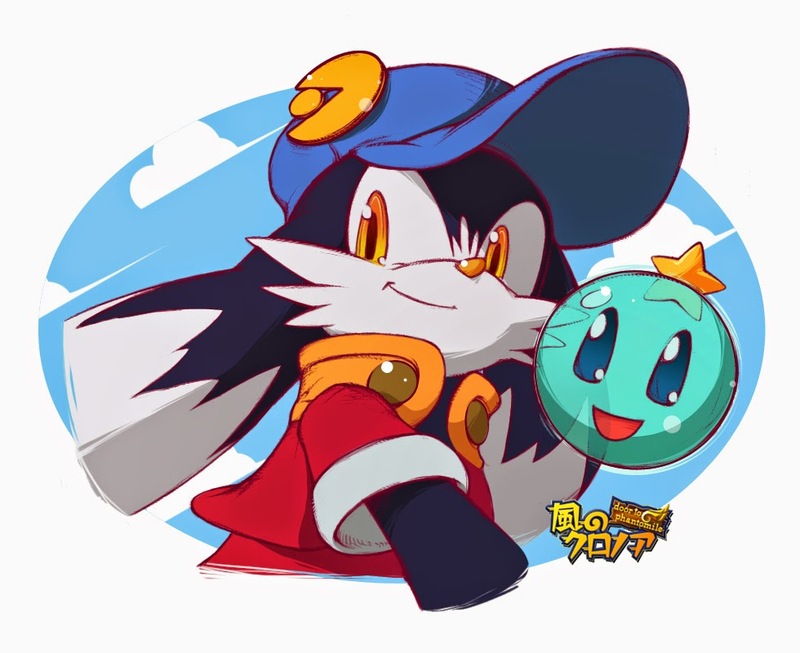 The first level of Klonoa is a warm, inviting place, and this theme helps convey that feeling. 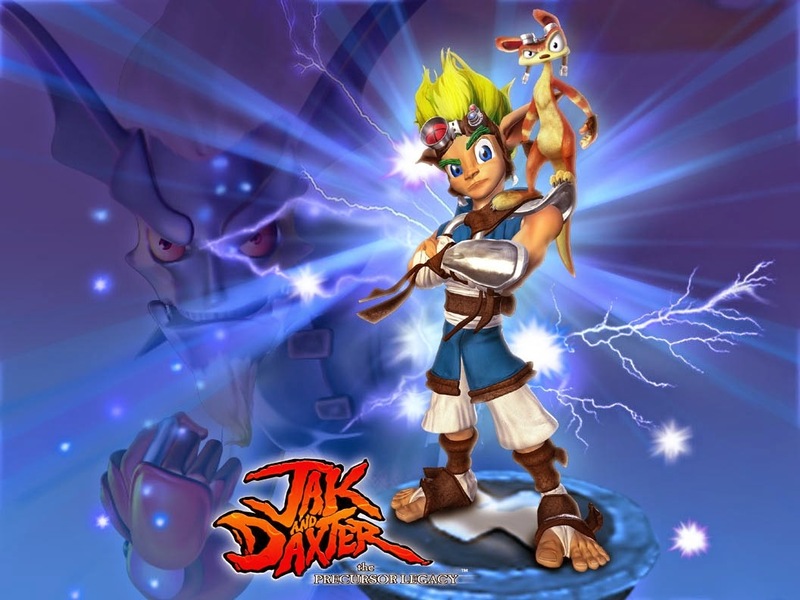 We're not going to lie-- the Jak and Daxter: The Precursor Legacy soundtrack is pretty dull and boring. We have a hard time remembering anything from it melodically with this theme as the exception, Mountain Pass. This level is a ride through a rugged mountain area full of explosives and other hazards to watch out for. While the soundtrack might be a disappointment, the actual game is anything but. After taking it to the links for four straight games, the Hot Shots crew decided to take up tennis as a new sport. Their first outing is a successful one, albeit not without issues, such as a lack of longevity. However, the PSP sequel, Get a Grip, offers a lengthy solo mode, customization, and a progressively more difficult challenge. Regardless of the iteration, Hot Shots Tennis continues its excellence in music with lively tracks such as the one that plays on the Alpine Heights Court. Another quest in the world of Kingdom Hearts has been completed, but the day is not entirely safe. After all, we have to have some more sequels and spin-offs, no? Yoko Shimomura delivers a fantastic ending piece to accentuate the finale of the PSP Kingdom Hearts entry, Birth by Sleep. Freedom Wars is coming over to the West sometime this year! The game's premise has you as a convicted criminal, charged with living, and your sentence is one million years in a desolate city. Bad for your character, great for you gameplay-wise! Check out this the announcement trailer for this super-stylized game.